A tree frog blinks his big red eyes. A tiger stalks his prey. A blue leaf monkey scratches his back. A tarantula scurries across the ground. A butterfly drinks from a tropical flower. A whipsnake darts its tongue. A nocturnal tarsier scans for food. A vividly patterned macaw comes in for a landing. 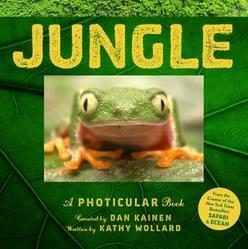 The newest addition to the hugely popular Photicular series (Safari, Ocean, Polar with more than 1.3 million copies in print) featuring the most colourful, most exotic creatures yet and a look into one of the most diverse ecosystems on the planet.